Awesome!!! Drag Racing: Bike Edition turned out to be every bit as cool as I had expected. It consists of short drag races and upgrades. It’s the perfect time waster for when you’re waiting in lines. You can upgrade the engine, exhaust, nitro, turbo, weight, wheels, and gearbox to get the most speed for your races. 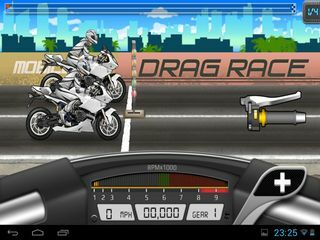 Each drag race is a few seconds long, so if you need to be ready to put your phone away at a moment’s notice, this is a convenient game. Losing a single round is no biggie, as you can go back and try again. It’s super simple, which makes it so addictive. It’s a drag race, so no turning and slowing down for turns, in fact, you don’t have to worry about accelerating either. You do get to switch gears and buy upgrades, though. You can upgrade the engine, exhaust, nitro, turbo, weight, wheels, and gearbox to get the most speed for your races. Drag, make money, upgrade and repeat. The only thing about this little game that I really feel I should warn you about is that it’s addicting. I really recommend keeping it on reserve for whenever you’re waiting on someone or something. If you play it on your own time, you’re likely to be there for much longer than you anticipated. Time becomes warped when you’re having this kind of fun. Now, like I said earlier, the first game is also cool. This one is really similar to the first game; they just changed it to bikes. So, if you didn’t like the first game, you won’t like this one. Or, if you played the first one and eventually grew tired of it, this sequel will rekindle your love for it and have you playing more and more. 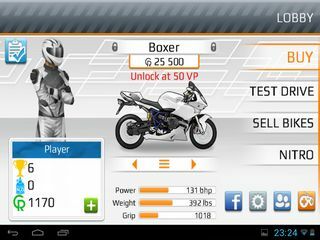 This is Drag Racing: Bike Edition review. Download this game here.